“Ding-Dong! Gleis eins, Einfahrt ICE 737 nach Hamburg Hauptbahnhof über Neumünster. Abfahrt 13:25. Vorsicht bei der Einfahrt!” Seconds later, a white worm with black and white stripes approaches the platform of Schleswig, south of Flensburg, where a half dozen passengers board the train heading to Hamburg and all places to the south of there. As the train departs the platform, it takes off at high speed, as it heads to its next station. Speeds of up to 350 km/ph (218 mph), with comfort seats, a children’s compartment, a rather formal Bord Restaurant and lastly, enjoying the company of other passengers while checking the train schedule via broschure or even computer. At the same time, one can see the landscape fly by with a wink of an eye. These are the characteristics of the Inter City Express trains (short: ICE-trains), the flagship of the German Railways (The Bahn). Since the introduction of the Experimental in 1985 and the ICE-1 in 1991, the ICE-trains have become the most beloved for its service and quickness yet the most scrutinized by others for their delays and air conditioning units going awry (as you probably heard through the song by Wiseguys in the last entry). But little do the readers realize is that the making of the fast train goes back many years, and it took efforts by many people and organizations to make it happen. In this 25th Anniversary of Germany special, we will look at why the ICE-Train has become an integral part of German culture since 1990 and why other countries are looking up to the Bahn and its trains for guidance in constructing their train lines and locs. Furthermore, we will look at the future of the ICE-Trains as the Bahn is entering its next chapter in its storied history. There is an analogy that best describes the development of the ICE-Train, comparing that with the one from the film “Chicken Run”: You cannot have the egg without the chicken- or was it the other way around? Click here to learn more. The same can be applied with the development of the first ICE Train: do you start with the train first or the rail line? The idea of the InterCity trains, which go as fast as 200 km/ph (124 mph) had been realized and put into service since the 1960s, providing services to cities with at least 25,000 inhabitants, yet the Bahn (which was known as the Reichsbahn at that time) was thinking bigger, bolder, and faster. And for a good reason: much of Germany has rugged hills and winding rivers, which made it difficult for trains to achieve speeds higher than 140 km/ph (87 mph). If one combines the amount of regional trains clogging up the rail lines, then it is a foregone conclusion that trains arrived at their destination- eventually! Henceforth in the 1970s, the German Ministry of Transportation (which was based in Bonn at that time) started an initiative to construct the main artery lines, which would serve fast train services in the future. This included the lines from Mannheim to Hanover via Frankfurt and Fulda, Würzburg to Frankfurt, Hanover to Berlin, Mannheim to Stuttgart, Ingolstadt to Nuremberg and Frankfurt to Cologne. Authorities had envisioned trains travelling along these lines at 300+ km/ph (186 mph) with little or no delays. At the same time, the government (which still owns the Bahn today) contracted to companies like Siemens, to construct the first fast train that was supposed to travel these lines. The end result, after many attempts, was the introduction of the ICE Experimental in 1985. It featured two locomotive heads on each end plus 2-3 coaches. The purpose of the Experimental was to test the maximum speed of the train in hopes to further develop the train for passenger use. The Experimental broke several records, including one on 1 May 1988 at a speed of 406.9 km/ph and topping the French Rail Service’s TGV’s record twice in May 1990: 510.6 km/ph (317.2 mph) on the 9th and 515.3 km/ph (320 mph) on the 18th. All of this was along the completed stretch of the line between Mannheim and Hanover, Würzburg and Frankfurt and Mannheim to Stuttgart. Although passenger use was restricted, the Experimental took the then Soviet President Michail Gorbachev to Dortmund in June 1989 to meet with Chancellor Helmut Kohl, introducing him to the advancement in train technology. Although the Reichsbahn set a speed limit of up to 300 km/ph for fast train services for safety reasons, developments involving the ICE continued, culminating in the introduction of the first of seven types that are still in use today. After several successful test runs, contracts were let out between the Bahn and German companies, like AEG, Siemens, Thyssen-Henschel, Krupp, etc.) to design the first of seven ICE class trains that are still in use. This class is not only the oldest in service today, but also the longest, as it features (minus the two loc heads) at least 15 coaches- one of which is a Bord Restaurant that resembles a double-decker but in reality, it provides a skylight view while dining. 2-3 coaches are reserved for first class. A computer information system was also included in the trains to provide travellers with information on the train connections- this was later included in future ICE trains. Unlike the InterCity trains, where passengers had to use steps to get on board, the ICE-1 became the first class to make boarding much easier, especially for those who need special assistance. And lastly, the train was climate-controlled, which made travelling a convenience year round. 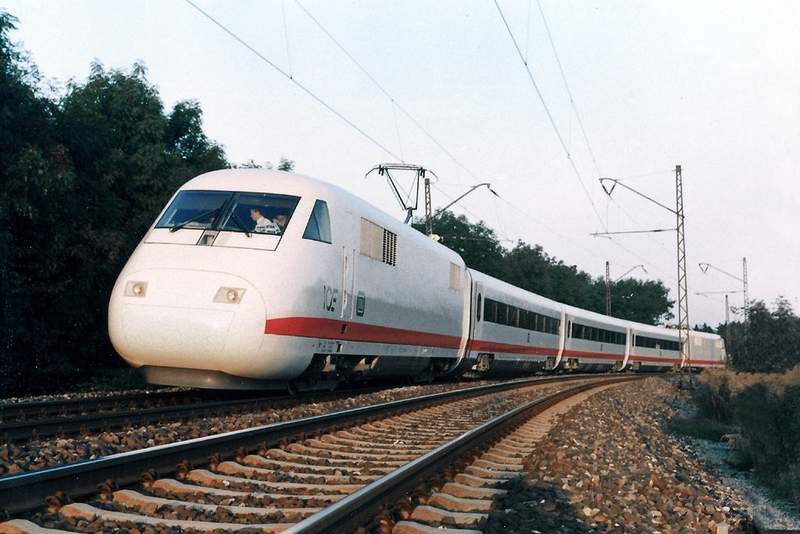 The ICE-1s made their debuts along the main artery route connecting Basel and Hamburg in 1991 with the first 41 trains being put into service. However, as the lines were expanded to include the Berlin-Hanover, Berlin-Leipzig-Nuremberg-Munich, Munich-Würzburg-Mannheim-Frankfurt, Frankfurt-Erfurt-Leipzig-Dresden, and the Frankfurt-Cologne-Rhein Region lines, plus the extensions to Brussels, Amsterdam, Zurich and Berne, more ICE-1 trains were manufactured and put into use. Ironically, the ICE-1 trains were introduced in the USA in 1993 to serve the coastal route- specifically, between Boston and Washington via New York City as well as as a demo route between Boston and Portland . Neither bore fruit because of the lack of interest in train travel and were later taken out of service. Yet despite the mentality that train service is for hauling freight, the thought of having high-speed train service has not escaped the minds of many Americans, especially because of environmental reasons, and many cities have been trying to copy the successes of Germany, albeit in snail’s pace. Despite the successful debut of the ICE-1, the only caveat is because of its length, the maximum speed of this train was 280 km/ph (174 mph). On some of the stretches, the train’s pace around the curves were on par with that of the InterCity trains, which raised questions about the effectiveness of the trains and the need to shorten the trains when designing the next class of trains. This includes the introduction of the ICE-2 Train which made its debut shortly after the ICE-1’s introduction. The danger of this mechanism is the potential of the train to derail due to crosswind during storms and headwind from oncoming trains. The end result: a speed limit of 200 km/ph (124 mph) and its use on lesser-used lines that use ICE-1 trains seldomly. Therefore, one can find ICE-2 trains on lines connecting Berlin, Hanover and the Rhein-Ruhr region, as well as between Hamburg and Cologne (later extending to Kiel), Bremen and Hamburg (extending to Berlin), as well as between Frankfurt and Cologne via Coblence. They are also used as a substitute for the next class of trains to be discussed, the ICE-T, should it be deemed necessary. Despite the train’s shortcomings, they have gained popularity in other European countries as they were implemented and/or mimicked in Belgium, Spain, Italy and France, just to name a few. That, plus its ability to reach speeds of up to 250 km/ph and its coupling technology made it useful on rail-lines that normally use InterCity lines. Therefore when it was introduced in 1999, it was put into service along the line connecting Berlin and Munich via Leipzig, Jena, Bamberg and Nuremberg as well as the line between Frankfurt and Dresden via Fulda, Erfurt, Weimar and Leipzig. They were later used on lines connecting Switzerland with Stuttgart and Munich, respectively, Frankfurt and Vienna, as well as between Berlin and Rostock and Hamburg, respectively (even though its terminus had been in Kiel at one time). The trains have two different types: one featuring 10 coaches and one with 7 coaches. This include the end coaches as the motors of the trains are found in the bottom part of the train. It was also the first to introduce the Bord Bistro, a sandwich/snackbar which normally would be found on InterCity trains, as well as a play area, which has been a focus of several critiques from parents, one of which was written by the Files in 2011. The ICE-T became a forefront of another class of ICE-Train which became one’s loss and one’s gain, the ICE-TD. As seen in the picture above, the train stopping at Schleswig is an example of a train class that is still being used despite its shortcomings, the diesel-version of the ICE-T. Introduced in 2001, the ICE-TD was similar to its sister but ran on diesel. It operated along the Vogtland route between Dresden and Nuremberg (extending to Munich) via Hof and Bayreuth as well as between Munich and Zurich. These lines were not electrified but the high number of passengers boarding along these routes justified the use of these trains. Yet technical problems combined with an increase in diesel taxes to be paid by the Bahn made its service shortlived. While the trains were decommissioned in 2004, they were recommissioned two years later to provide extra service for those going to the World Cup Soccer tournaments taking place in Germany. Subsequentially, all 20 train units were bought by the Danish Rail Services (DSB) a year later and have since been serving the northern half of Germany: one line between Berlin and Aarhus via Hamburg, Flensburg and Kolding and one between Berlin and Copenhagen via Hamburg, Lübeck, Fehmarn and Ringsted. A happy ending for a class of trains that was one the black sheep of the Bahn but has become the darlings for the Danes. At the same time as the ICE-T, the ICE-3 made its debut for the Bahn. Featuring eight coaches including the end coaches, the trains up until most recently had been the fastest of the ICE-Trains in service, reaching maximum speeds of up to 330 km/ph (205 mph), making them suitable for the main artery tracks that do not require the twists and turns of the ICE-2 and ICE-T trains. Introduced for the World Expo in Hanover in 2000, the trains have since served the lines connecting Frankfurt-Basel, Frankfurt-Amsterdam via Cologne, Frankfurt-Brussels via Cologne and Frankfurt-Paris via Strassburg. The Velaro version of the ICE-3 train is the newest version of the ICE train, and perhaps one that will dominate the European continent if the Bahn has it their way. The concept was first conceived in 2009 and since 2014, the first trains have taken over some of the important lines, namely between Cologne, Frankfurt and Munich. 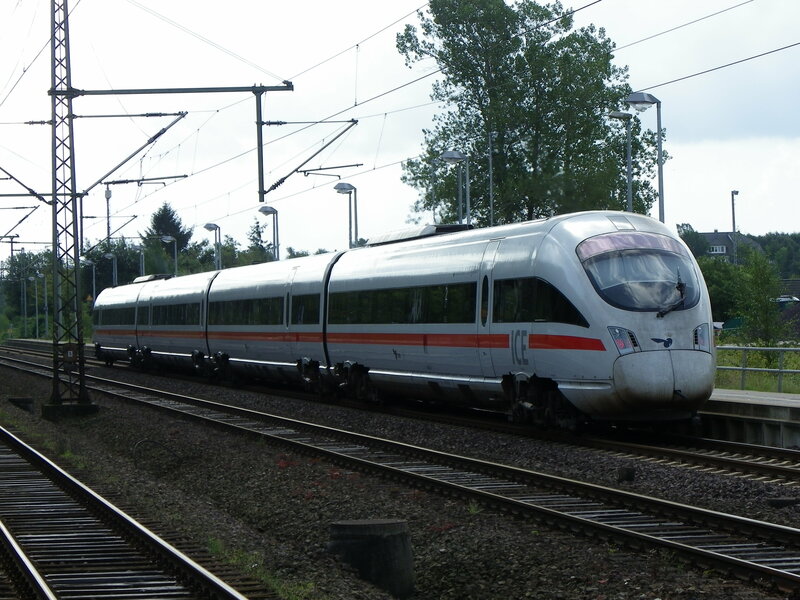 This may change in the next year as more of these trains, looking sleeker than the original ICE-3 but going just as fast as its predecessor, are set to take over some of the main artery lines, including the new line between Berlin and Nuremberg via Erfurt. 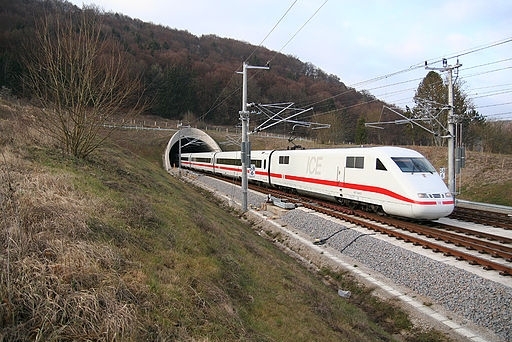 In addition, with its successful test run through the Euro-Tunnel, the Bahn is looking at commissioning these trains to serve the line to London via Paris and/or Brussels. As the time to travel to Frankfurt from London takes six hours instead of 18-20 with normal trains, the use of these trains for this purpose, if successful, could take the Bahn to newer levels, causing other countries to look at Germany as an example of how passenger rail service can be developed. Sadly though, the introduction of the ICE-3V will come at the cost of two train classes: The ICE-1 and ICE-2, despite their recent renovations, will be decomissioned, bit by bit, beginning in 2020 and 2025, respectively. While the newer versions will change the image of the Bahn, many people will miss the older versions that have made rail travel faster but comfortable. Finally, the latest advancement in train technology that will take rail travel further beyond 2020 is the ICx. The concept has been worked on by several companies in the private sectors but the trains will feature both this version, a cross between the ICE-2 and the ICE-3 with 12 coaches, as well as a double-decker version. The designs have not yet been finalized, but two factors are certain: They will be slower than the ICE-trains with speeds, maxing out at 200 km/ph (124 mph), plus they will replace the existing InterCity trains that are over 35 years old and are meeting the end of their useful lives. Already planned is the commissioning of the lines in the eastern half of Germany beginning in 2020, the lines one which InterCity and former ICE trains once travelled will have these trains in use by 2030, including areas in Bavaria, Baden-Wurttemberg and parts of northern Germany.